© 2002, © 2017 by Paul Freeman. Revised 7/22/17. A 1962 aerial photo showed 6 single-engine aircraft parked northwest & southwest of the end of Coram's east/west runway. 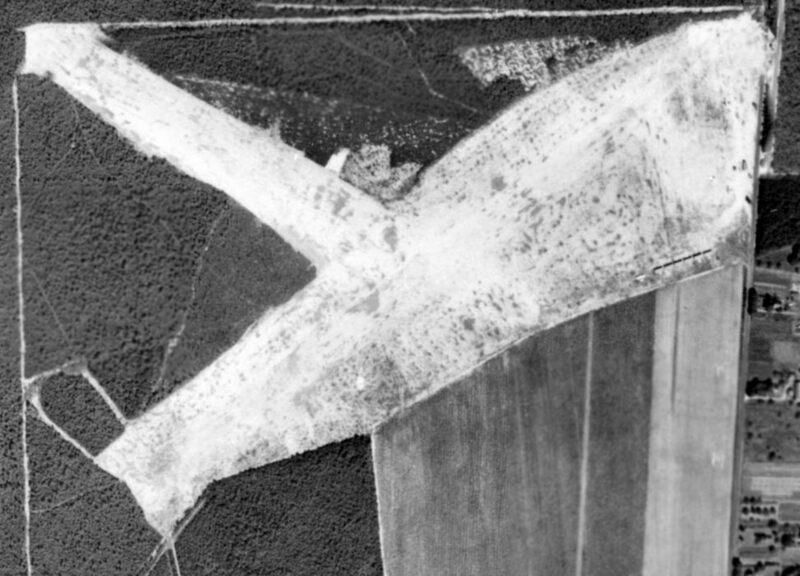 No airfield was yet depicted at this location on a 1947 aerial photo. and operated throughout its existence by Tom Murphy, a former military flight instructor & skywriter. Tall trees at all runway ends reportedly made for interesting approaches. which showed 6 single-engine aircraft parked northwest & southwest of the end of Coram's unpaved east/west runway. 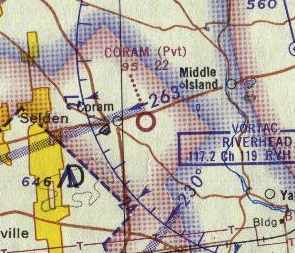 Coram Airport was not yet depicted on the 1966 NY Sectional Chart. 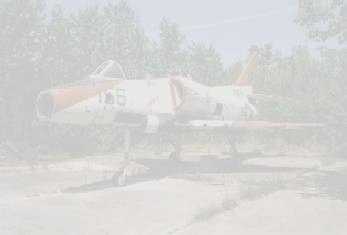 (described as a dilapidated pilot lounge / workshop) on the north side of an unpaved runway. was on the 1967 NYC Local Aeronautical Chart. It depicted Coram as a private field having a 2,200' unpaved runway. 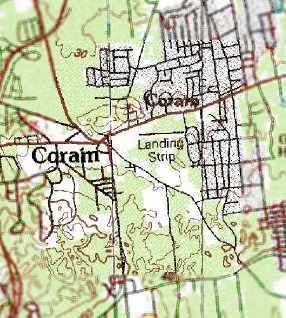 The earliest topo map depiction which has been located of Coram Airport was on the 1967 USGS topo map. with a few small buildings on the northwest side. with a northeast/southwest runway having been added at some point between 1967-72. 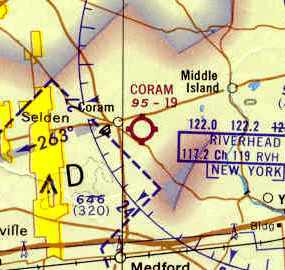 The 1972 NYC Terminal Control Area Chart depicted Coram as a public-use airport having a 1,900' unpaved runway. A 1978 aerial photo showed 6 single-engine aircraft parked on the northwest side of the end of Coram's east/west runway. Ralph Fisch recalled, “I spent many, many hours of riding my bike to watch the Cubs & an old Cessna 172 (straight tail) operate out of Coram Airpark. A circa 1980 aerial view looking west along Coram's east/west runway. A circa 1980 photo of a Piper Cub landing on Coram's south runway. 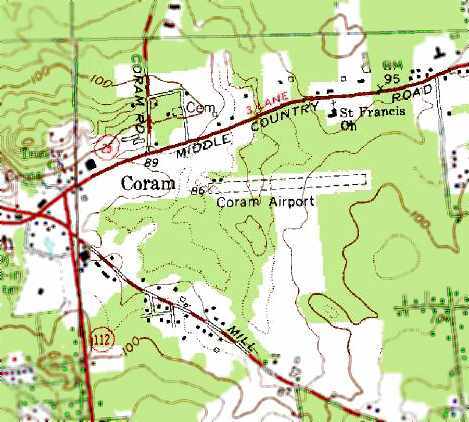 depicted Coram as a private airfield having a 1,900' unpaved runway. 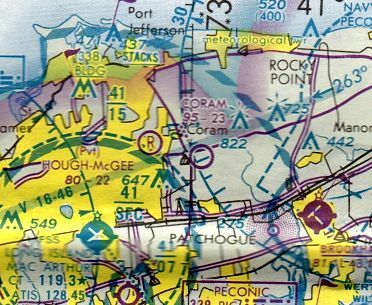 The last topo map depiction which has been located of Coram Airport was on the 1984 USGS topo map. It depicted a single east/west runway, labeled simply as “Landing Strip”. 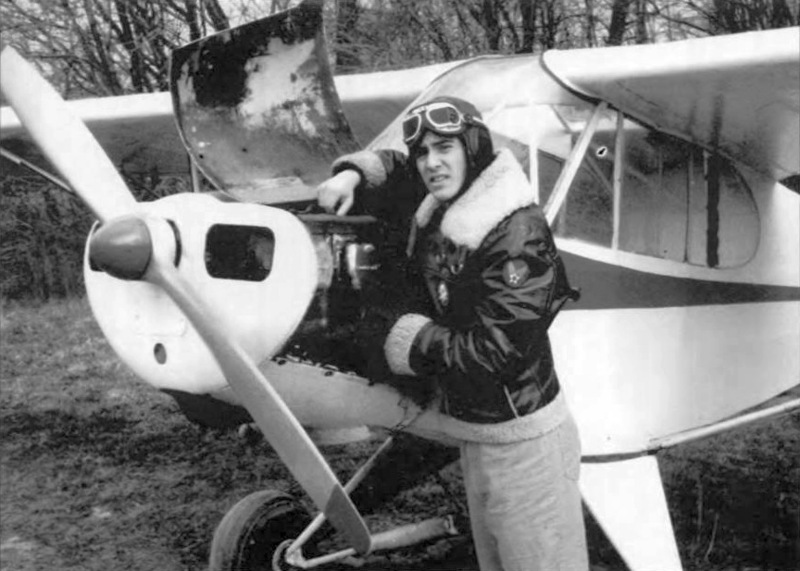 The last photo which has been located showing an aircraft at Coram Airport was a circa 1985 photo of Joshua Stoff checking the oil of a Piper Cub. 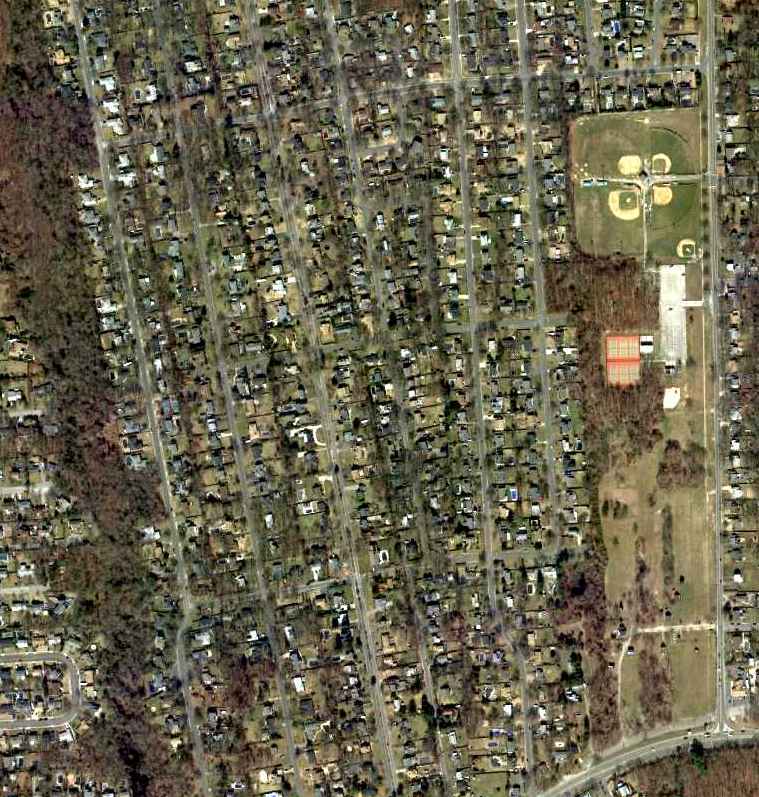 A 1984 aerial photo showed Coram in the same configuration as seen in the 1978 aerial photo, but devoid of any aircraft. was on the December 1986 NY Sectional Chart (courtesy of Kevin O'Reilly). It depicted Coram as a private airfield having a 2,300' unpaved runway. Bruno Schreck recalled, “I think I was the last guy to land & takeoff from Coram Airport, in a 'real' airplane in about 1989. I dropped off a client there in my Cessna 172RG Cutlass. It [Coram Airport] still showed on current charts of the time. And I had called the listed airport operator about 2 weeks before to ask permission & about conditions. I landed to the northeast at about sundown & taxied to the northwest ramp. There were several ultralight operators putting away their aircraft when I taxied up. Those ultralight pilots seemed totally shocked. As it happens, the guy I had talked to came over, but he had either forgotten that I had inquired, or that I had a 'real' plane (or both). Since it was around sundown, with no runway lights, I don't think I even shut down the engine. I just made my drop-off & taxied back for takeoff. as it was no longer depicted on the December 1993 NY Sectional Chart (courtesy of Ron Plante). 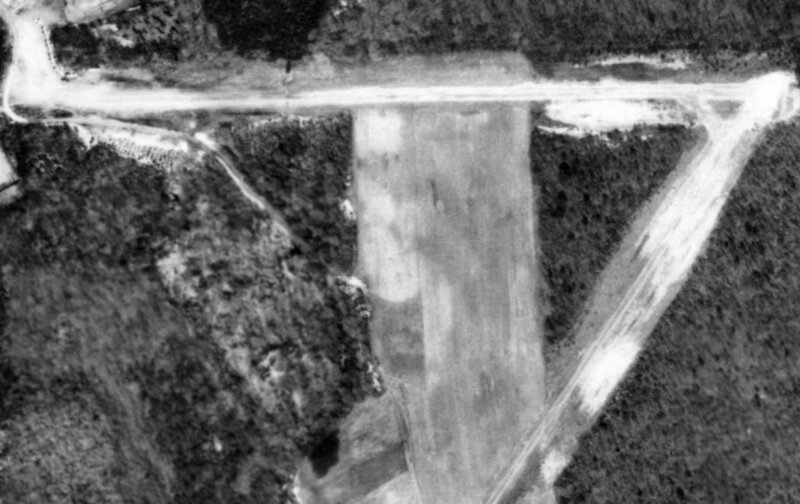 A 1994 USGS aerial view showed Coram Airpark's 2 runways remained intact though deteriorated. A 3/6/12 aerial view looking southwest showed that Coram's 2 runways remain intact almost 30 years after the airport was abandoned. Coram Airport is located southeast of the intersection of Middle Country Road & Mt. Sinai Coram Road. 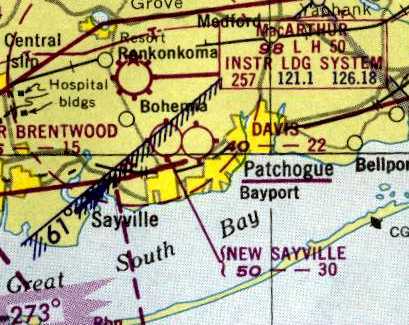 Sayville Airport, as depicted on the March 1940 NY Sectional Chart (courtesy of Tim Zukas). 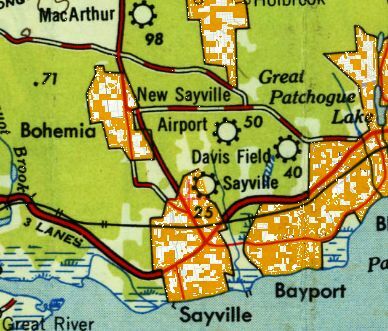 which depicted Sayville as an auxiliary airfield. was an 8/7/42 aerial view looking north from the 1945 AAF Airfield Directory (courtesy of Scott Murdock). It depicted Sayville Airport as an oval-shaped grass landing area with a single hangar at the north end. The November 1942 NY Sectional Chart (courtesy of Ron Plante) depicted Sayville as a commercial/municipal airport. as a 22 acre rectangular property having a 1,500' north/south all-way sod field. Sayville was described as having 2 metal & wood hangars, measuring 50' x 50' & 40' x 25'. but “Not in operation” (most likely due to wartime security restrictions on small civilian airports near the coasts). and they opened the Long Island School of Aeronautics which, for veterans, qualified under the GI Bill of Rights. 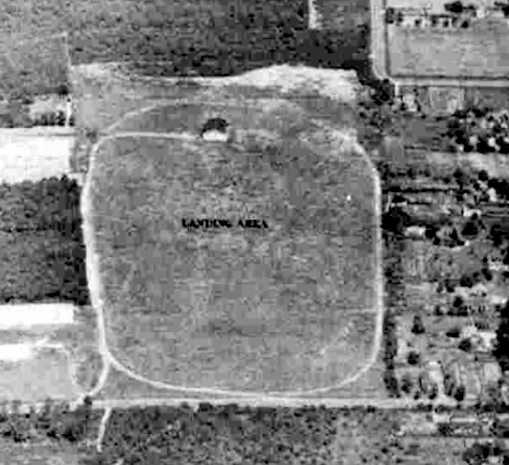 The last photo which has been located of the original Sayville Airport was a 1947 aerial view. No planes were visible on the field. Charles Schnepp recalled, “Sayville Airport... I got my pilots license there in 1948. It was a grass field with dirt runways & was located just a few miles south of McArthur Airport. It was owned & operated by Al Thomas & Sis Farrell. He was the instructor, she was the manager. They had no other employees. which also depicted the replacement New Sayville Airport to the north. which instead depicted a “New Sayville” Airport a half-mile further south. 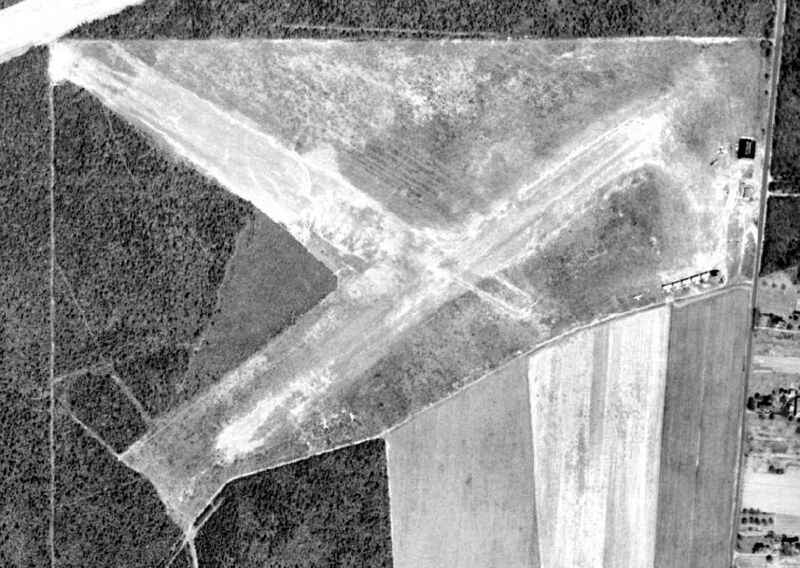 A 1954 aerial photo did not show any recognizable sign of the original Sayville Airport. 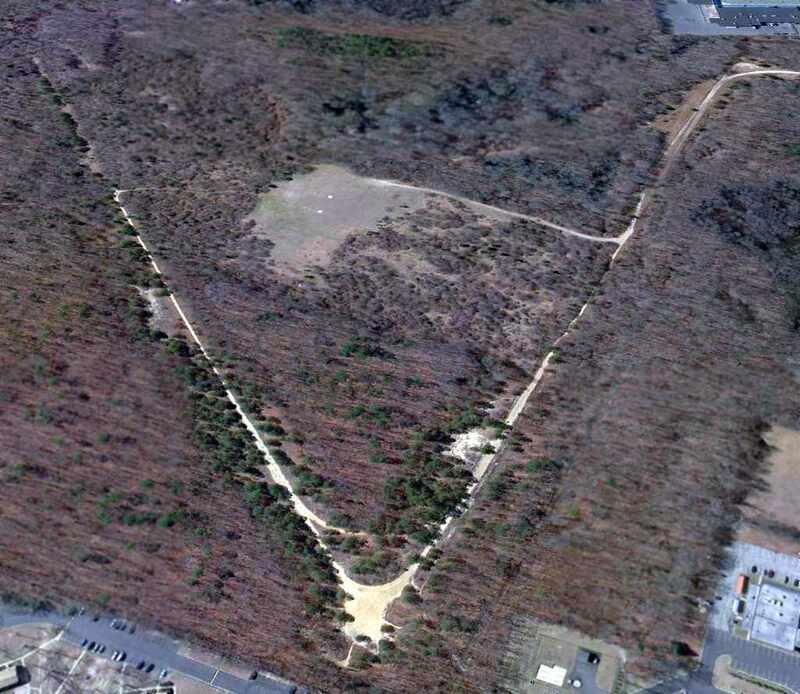 A 3/6/12 aerial photo did not show any remaining trace of the original Sayville Airport. The site of Sayville Airport is located northwest of the intersection of Broadway Avenue & Montauk Highway. 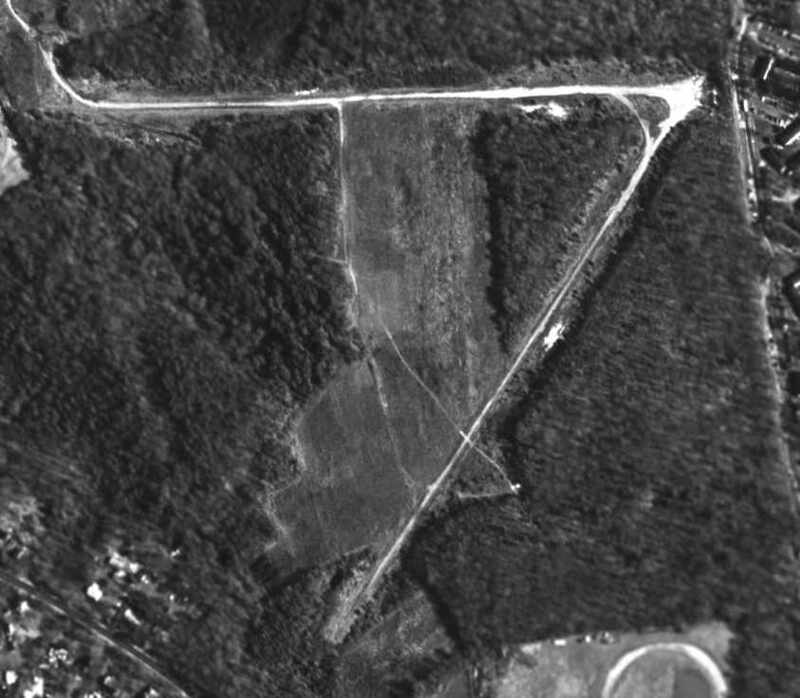 A 1947 aerial view of New Sayville Airport. 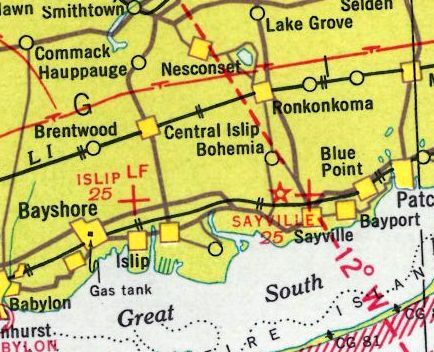 New Sayville Airport was not yet depicted on the January 1945 NY Sectional Chart (courtesy of Ron Plante). According to the Sayville Library, “After approval, in 1945 the land was bought by Allan Thomas who, in partnership with Philomena 'Sis' Farrell, opened the Airport. as well as a licensed airline captain in his own right - established the Long Island School of Aeronautics, a flying school. The first student was George Maklos, a bus driver from Patchogue. many under the GI Bill of Rights, and the airport had 6 T-shaped hangars. Among students were local physician Peter Lerner & local lawyer George McInerney; McInerney entertained at one airshow with aerobatics in a biplane. A second popular show act was 'The Flying Farmer' in which Thomas demonstrated what NOT to do in the air. A third advertised attraction were passenger flights including 'Night Flights Over Sayville' at $2.50 each. Beyond various levels of flight instruction, the airport also offered standard services of hangar storage, tie-downs and repairs. This small general aviation airport replaced the original Sayville Airport located just a half-mile to the south. The earliest depiction which has been located of New Sayville Airport was a 1947 aerial photo. 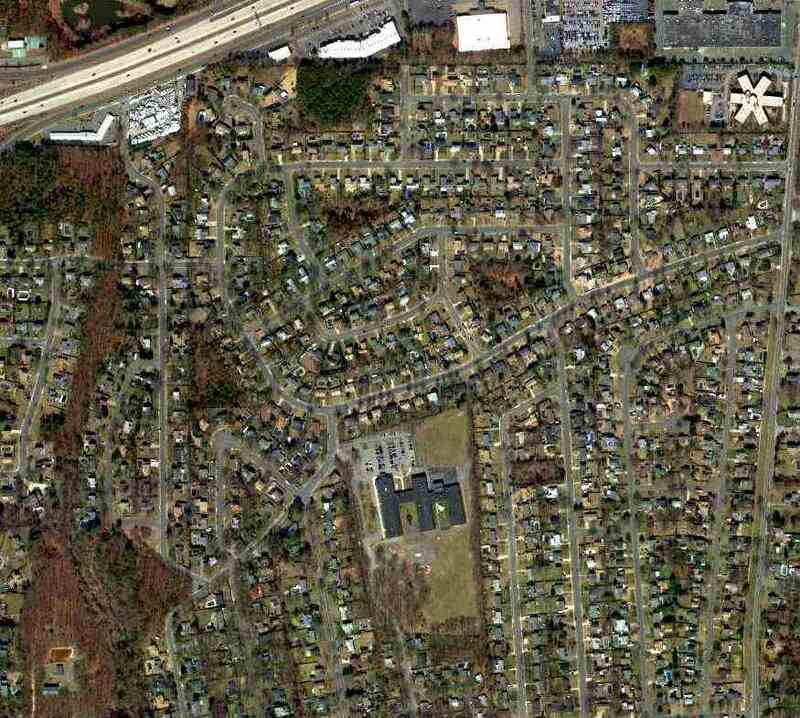 It depicted New Sayville as having 2 grass runways in an X-shape. One single-engine aircraft & 6 individual T-hangars were visible on the southeast side. The earliest aeronautical depiction which has been located of New Sayville Airport was on the July 1949 NY Sectional Chart (courtesy of Ron Plante). It depicted New Sayville as having a 3,000' unpaved runway. 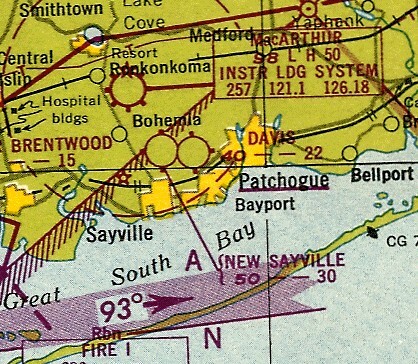 The 1949 USGS topo map depicted both the New Sayville Airport & the predecessor Sayville Airport to the south. 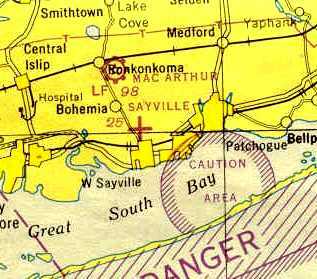 The last aeronautical depiction which has been located of New Sayville Airport was on the 1950 NY Sectional Chart. A 4/7/54 aerial photo depicted New Sayville as having 2 grass runways in an X-shape. A hangar, 7 individual T-hangars, and 4 single-engine aircraft were visible on the east side. 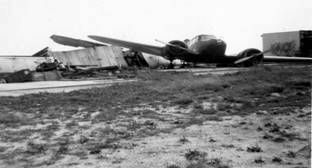 A Cessna T-50 Bamboo Bomber & another aircraft in the aftermath at New Sayville Airport from Hurricane Carol in September 1954. 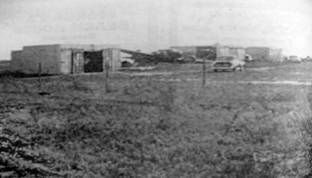 Another view of the Cessna T-50 Bamboo Bomber in between some small buildings at New Sayville Airport after Hurricane Carol in September 1954. According to Webb Morrison, “Unfortunately, Hurricane Carol in September 1954 destroyed both planes & hangars. resulted in Thomas selling the 122 acres to developers in June 1955. 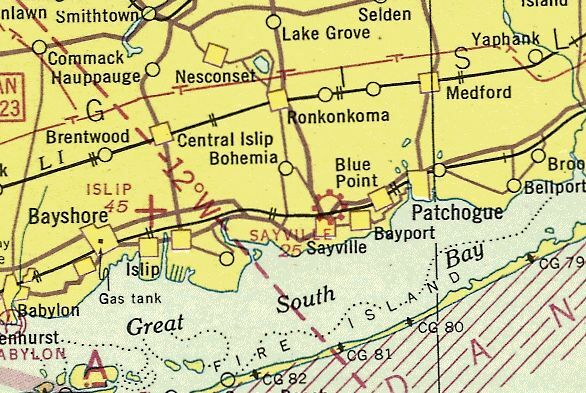 New Sayville Airport was no longer depicted at all on the 1957 NY Sectional Chart (courtesy of Mike Keefe). with the 2 runways still remaining intact though deteriorated. It appeared as if only the foundations remained of the hangar & T-hangars. David Van Weele reported, “The landing field was removed probably in the early 1960s. I worked on designing the housing development that is there now. A 1966 aerial photo showed houses covering the southern half of the airport site. The northwest end of the runway remained recognizable, along with the foundation of the main hangar. erasing the last traces of New Sayville Airport. 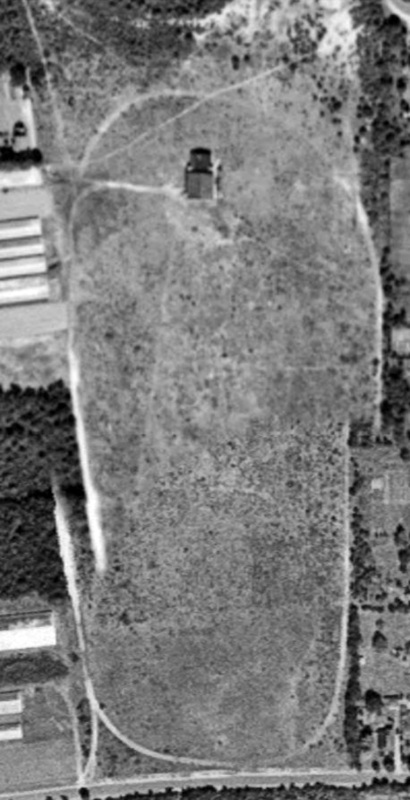 A 3/6/12 aerial photo did not show any remaining trace of the New Sayville Airport. The site of Sayville Airport is located southwest of the intersection of Broadway Avenue & Sunrise Highway.